Carol Gilligan, an educational psychologist at Harvard University, studies the personality development of young girls. Initially, she attempted to correct a research bias by which others had investigated only boys. As her work progressed, Gilligan discovered that boys and girls employ distinctive standards in making moral decisions. Gilligan’s more recent work targets the issue of self-esteem. Her research team interviewed more than two thousand girls, ranging from six to eighteen years of age, over a five-year period. Their responses point up a clear pattern: Young girls start out with considerable confidence and self-esteem but find these resources slipping away as they pass through adolescence. Why? Gilligan claims that the answer lies in our culture our way of life, she argues, still defines the ideal woman as calm, controlled, and eager to please. Then, too, as girls move from the elementary grades to secondary school, they encounter fewer women teachers and find that most authority figures are men. So by their late teens, women are snuggling to regain much of the personal strength they had a decade before. Illustrating this trend, Gilligan and her colleagues returned to a girls’ school, which had been one site of their research, to present their findings. 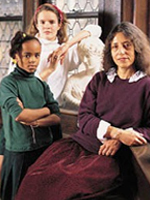 Most younger girls who had been interviewed were eager to have their names appear in the forthcoming book; the older girls, by contrast, were hesitant: Many were fearful that they would be talked about. Sources: Gilligan (1990) and Winkler (1990).